Social media is still a young and highly volatile industry. New companies and vendors and tools pop up every year. And slightly older companies get bought up and merged into larger companies every year. These acquisitions often reflect both the big trends of the day and hint at what is coming next. 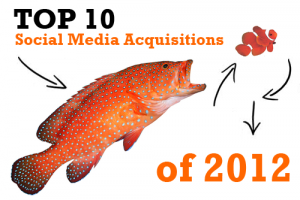 Last year we broke down the top 2011 social media acquisitions. In 2011 Facebook was focused on some important acquihires and mobile talent. And most of the location apps had peaked and got bought up. Also, Adobe and Salesforce made big investments in building out their enterprise social media divisions. This year, the biggest move was Facebook’s pick up of mobile social networking star Instagram. This may go down as one of the smartest moves ever by Zuckerberg as Instagram has continued to skyrocket since the acquisition, even now beginning to rival Twitter on mobile. Oracle made a series of big moves that now puts them neck and neck with the large enterprise social competitors of Adobe and Salesforce. Microsoft and IBM are also in the mix there. And of course Salesforce made a big splash by adding Buddy Media to their Radian6 teams. In two years they have purchased two of the largest social media companies in the world. Clearly they will have some overlap to deal with here, but the experience, software platforms, and client bases that Radian6 and Buddy Media bring to Salesforce is a huge dent in the enterprise social media market. Other significant pick ups include the Slideshare and Rapportive pick ups by LinkedIn, smart moves, Microsoft bringing Yammer under its wing, and Google’s odd purchase of Wildfire. Google owning a software vendor that makes its money on Facebook tabs is a story that I hope is not done yet. Microsoft picked up a huge client list with Yammer. The question is will they be able to build anything else of value for those social customers. Clearly this was the year of Facebook API windfalls. Buddy, Vitrue and Wildfire were the big three and all of them are now amongst the software giants. There were plenty of other important social media acquisitions this year. The following is a list of top takeovers from 2012 that did not make the top 10 but impacted the industry. They are in chronological order. If we missed anything, please add it in the comments to we can add it to the list. Include a link to a press release.